Carlos is one of our Cook Instructors. 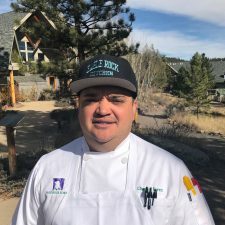 He is originally from Maracay, Venezuela and he moved from Miami to Estes Park a year ago. Carlos has been working as a cook for more than 15 years in Miami in different types of restaurants such an Italian, American, Latin, etc. and that is why his style has a mix of all those types of cuisines. Carlos is responsible for supervising student kitchen patrol teams in meal preparation and cleanup. Carlos lives in Estes Park with his family and one of his two sons. His other son lives in Miami, Florida. My favorite thing about Eagle Rock is to work with the students and to see that I am a part of their personal development.